Every relationship goes through its share of struggles. So why do some relationships end in divorce while others seem to find a way to work things through? Experts say that this typically has a lot to do with several factors. One factor includes the kinds of issues that cause the couple to struggle. Chances for resolution are better if the problem is situational and not chronic. Many couples fight over the same issue again and again. If this is happening in your relationship, you are in a cycle that will rarely end without outside help. In some cases the couple may be dealing with differences in their values and beliefs that often don’t come to light until challenges in life occur. Our beliefs are highly ingrained, and we rarely can change them simply to accommodate another person, even someone we value and love. We can learn to be more flexible and to compromise, but there comes a point when the necessary changes are just too extreme. It would mean giving up on what we believe or to make choices that would not be in the best interest of our children and ourselves. The success of a marriage also depends on the psychological health of the individuals involved. Both people have to be willing and able to work on their independent issues. In the case of one of the individuals suffering from a mental health issue, chances of real progress are greatly diminished. If your partner truly makes an ongoing effort on their own to make changes, the marriage can still be reasonably healthy and satisfying, but it will remain challenging for years to come. 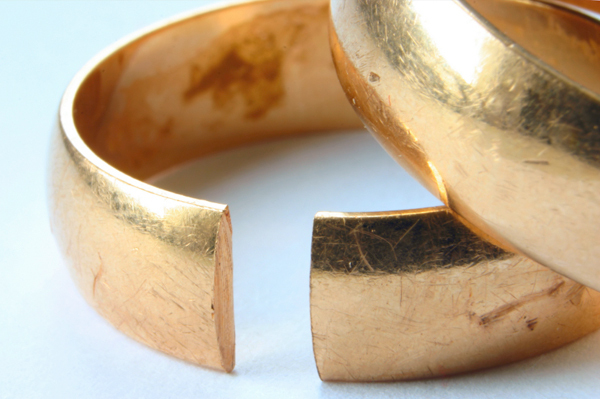 I have often asked myself, how does divorce really come to pass? Granted, there are some people that just do not want to be married, or they just give up and don’t have the desire to work on a relationship. However, most people do not want to be divorced as a general rule. It is something that happens when all avenues have been exhausted. Are there predictable and reliable signs of the end? Is there a clear way to determine if things are truly getting better or worse? How do you know when you shouldn’t put in more time, and it is time to walk away? In reviewing dozens of relationships and discussing my observations with experts, including Sharon Rivkin, author of The First Argument, there are four stages that typically occur. It can be difficult to see these phases when you are going through them; however, if you can see yourself and your relationship in one of these stages, you might be able to still change the direction you are headed. You may also see that the relationship is truly toxic, and it is time to do something before things get worse. Preserving the individuals and the children, if there are any, should be the number one goal. We often sacrifice the well-being of the family members in an attempt to save something that can’t be saved. A couple may sense friction but rather than deal with it, they tend to fall into their busy lives and distractions. The fact that the relationship is beginning to struggle fades into the background. They dismiss the comments, the small fights and the hurt looks. They fail to notice the same issues that are coming up repeatedly, and the emotional rictor scale is showing increasing instability. It is in this stage that counseling, arguing and bargaining truly become the focus of the relationship. Depending on how healthy the individuals are, how committed they are to making changes and how much they truly care about the other person and their happiness, the marriage may have a chance. Once couples enter counseling, they often make an attempt to do better and show some effort, but this can produce a false sense of security. Therefore it’s not reflective of what is actually happening or will happen in the near future. In some cases, people will leave the relationship when counseling doesn’t prove to be the magic cure. They know the other person either can’t or won’t change. They know they can’t live with things as they are, and they move on. However, many people are not able to take this incredibly difficult step. This may be due to emotional reasons or it may be due to more practical issues. They decide they are going to simply “live with it”, and they choose to accept that this is their life. Not every relationship has to experience this. Some couples live very separate lives and remain together. Through appropriate, outside activities, they can find a sense of contentment that makes their lives work. However, many couples are now deeply unhappy and at least one partner is feeling very unloved and hopeless as their needs continually go unmet. This can often turn into resentment and anger. The problem comes when that anger and hurt materializes, either internally or externally. If there are children involved, they will most often pay the price. I would hope that everyone would always choose to fight, to work and make their marriages last. However, as you move through this process, be aware there are signs that can tell you where you are headed and what your life will look like when you get there. It is a choice that needs to take all the members of the family into account. Children need security, consistency and love. Sometimes we do need to make difficult choices to give our families the healthiest lives we possibly can.